Not long ago, I visited the scene of Occupy San Diego protests, and spoke with some of the protesters. The evening was rainy, and they were cold and hungry. My young daughter asked one of the protesters a lot of questions — why were they outside? What did they want people to know? Their messages were diverse and often confusing, but they were all kind and pleasant to us. Some called for the release of a man they believed to be a political prisoner. Some called for an end to corporate greed. But regardless of their message, they were ALL doing what Thoreau called us to do to the best of our ability — be good for something. Many of them were very poor — some had lost jobs, some were homeless. They had various ethnic, religious and educational background. But they were all Americans, and they were all were taking up the right and burden of doing civic good by making their voices heard. Isn’t it amazing to be an American? No one in our country is too poor, too young, too helpless, too uneducated to speak up and be good for something. We are all doing our best to make our world better. When the police came to the Occupy group and the two groups faced each other, it was clear, too, that these young police officers were trying to do good in their own way, too. They were polite to the protesters, and stated their aims while the protesters stated theirs — two groups of people trying to do good in the world in the only way they knew how. Here is an amazing video along those same lines, sent from my cousin in Kansas, to my father, to me. Take a few minutes to see it. 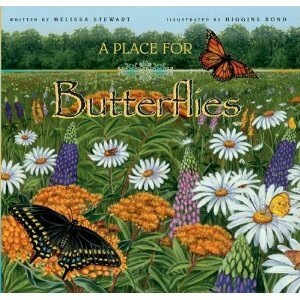 Melissa Stewart’s book A Place for Butterflies has inspired me to shorten and tighten several manuscripts I am working on. Stewart’s writing is spare and beautiful, and inspires readers by showing them what is amazing in nature, and also what they can do to help the environment.